Individuals 65 and older are at the highest risk for injuries from falls. Bathrooms pose the highest danger as it’s easy to lose balance especially on a wet floor or slippery bathtub. The bathroom can be a dangerous or confusing place for anyone that is handicapped, disabled, or experiencing mobility impairments resulting from injuries, balance challenges, arthritis, dementia, incontinence, or general old age. The one place where you want privacy the most is in the bathroom, and yet this is where people end up needing the most assistance. Individuals want to safely take care of themselves in the bathroom with less, or no assistance from others. This can help improve the quality of life and regain their independence. To prevent falls, clean up any powder or lotion spills from the floor as they can leave a slippery residue causing a fall hazard. Remove all clutter from the floor including clothing, towels, and toys. Fortunately, there are many quality safety devices for elderly adults available for the safety of your bathroom. Using the right equipment in the bathroom can help to avoid slips and falls. Here are some examples of preventative measures that will help provide stability, balance, and safety in the bathroom. · Shower Chairs & Bath Transfer Benches make bathing easier as you can stay seated while taking a shower. · Raised Toilet Seats add extra height to your toilet seat making it easier to sit down and get up from the toilet. 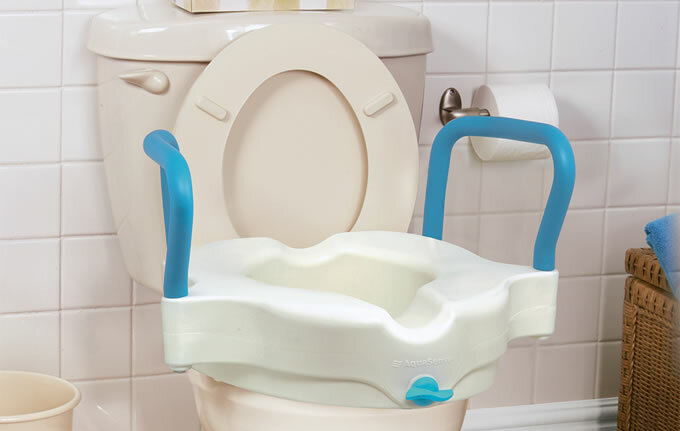 · Commodes are a safe alternative for those who do not want to use bedpans or diapers. Commodes can be used as a raised toilet seat, a toilet safety frame, or as a bedside commode for those who have limited mobility challenges in navigating to the bathroom. · Toilet Safety Rails offer secure assistance when getting on and off the toilet. These portable toilet frames promote safe standing. · Grab Bars also known as handlebars help you get in and out of the tub and shower independently. They also enable a person to maintain balance and lessen fatigue while standing. · Tub Safety Rails attach securely to your tub providing a safe surface to hold onto while entering or leaving the bath. · Some other bath safety items include bath lifts, hand help showers and safety bath mats. Every room in the house should be safe but the bathroom especially needs high-quality care and maintenance. Proper equipment enhances the safety and usability of your bathroom. Medical Mart offers a wide selection of bathroom safety products. Our experienced consultants can help guide you to help keep seniors and the disabled safe in the bathroom.